The Bay Area has many things, but a place like Hollywood Boulevard isn't one of them. Hang out with me as I stumble through the City of Angels in search of the American Dream. HOLLYWOOD (KGO) -- The Bay Area has many things, but a place like Hollywood Boulevard isn't one of them. The dreamscape of somewhere like Fisherman's Wharf is vaguely comparable, but the hilarious and endearing seals on the K-Dock are replaced with masked men in superhero costumes, all poses and grandeur, asking for tips after taking a photo with your Batman-obsessed toddler. The restaurants and local businesses selling straight-from-the-bay seafood are replaced with chain restaurants with neon lights attached to their storefronts and lines spilling onto the boulevard zig-zagging as LAPD officers try to create order. After a $20 Uber ride, I found myself across the street from the Roosevelt Hotel, staring up at its iconic neon sign -- calling me to it like a moth to a lighter in the hands of a smoker. Hollywood -- moths to flames. "No," I said to myself. "This is not the time to attempt to sneak into a Hollywood party. "This is a search, not for fame and fortune, celebrities or star maps. This is a search for the American Dream, and why so many choose to come to this place, this boulevard, to find it." I stumbled down the Walk of Fame as stars passed under my feet. Gilda Radner. Marilyn Monroe. RuPaul. They found their dreams, so why can't everyone? I walked past a woman reading tarot cards, a group of dancers performing to the soundtrack of "The Purge," and finally Batman, Aquaman, and Captain America, who jokingly or creepily called out to me, "You can call me Steve." You can interpret that. Then, almost out of nowhere, a big crowd swelled in front of the TCL Chinese Theater. I figured it was just a Marilyn Monroe impersonator wowing the crowd or a homeless person yelling obscenities at tourists and thought about turning around, but kept moving toward the crowd. Between the iPhones flashing and children pushing through toward the theater as their parents tried to wrangle them, I couldn't see or hear what everyone was looking at. "Hey, do you know what's happening?" I asked a kid in a Dodgers cap. "Aaaaahhhh," he trailed off. "Nah. Not really." "Huh," I said, wondering why he was waiting around for something that he didn't even know about. "So, just like...waiting around?" "I don't want to miss anything. It's Hollywood," he said, taking the cap off and wiping his brow, tiny drops of sweat running down his flushed red cheeks. I let him wait and asked several other people why they were standing around with their cameras out. "I just saw a crowd, so I joined it." "I may see a celebrity." "I don't know, people seemed excited." It seemed that the fear of missing out, even if you don't care or don't know what is happening, is stronger than the fear of forgetting to live your life. After about 10 questions, and several irritated tourists later, a security guard for the Hard Rock Cafe next door revealed that the event was a movie premiere for a Jaws-like summer blockbuster called "The Meg." I swerved around the crowd, tripping over tennis-shoes and discarded soda cups, beer cans and cigarette butts with one or two puffs left in them, wondering about the American Dream. Did the people waiting for the stars of "The Meg" have one? Did they imagine that Los Angeles could give it to them? Yes. I said Elvi -- two Elvis impersonators. They were together in front of the trendy Coffee Bean and Tea Leaf cafe, with two cups of water on the hardwood counter in front of them. Those plastic cups were sweating with the beads of condensation you'd recognize from a cocktail that sat out in the sun for too long on a long Los Angeles day. 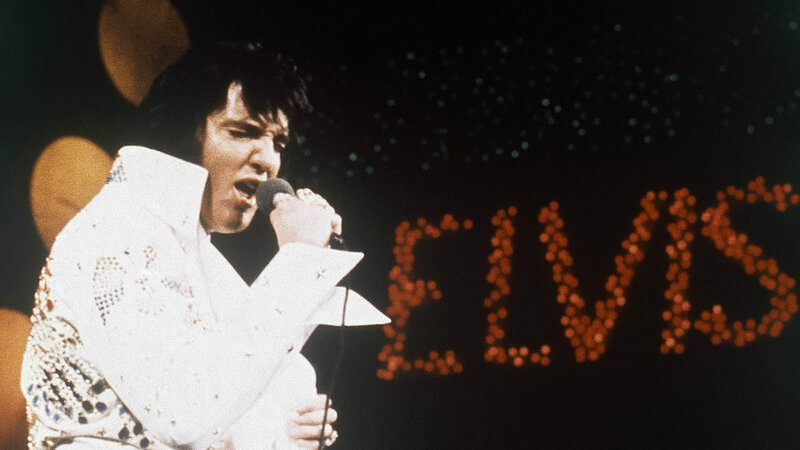 Elvis One, as I will refer to him, embodied Vegas Elvis -- the puffed-out hair, massive sideburns, glitter, gold, grease and grace -- big rings and an even bigger personality. Elvis Two, had the 1970s red and gold look, a little more end-of-career Elvis, lights fading, but sunglasses still on, still fighting. "Hey lil' mama," said Elvis One, clad in a black jumpsuit dripping with rhinestones and velour. His face glistened with hours worth of Hollywood hustle. "Elvis, talk to me," I said, putting a one-dollar bill in his hand. "What's your dream? What brings you to Hollywood Boulevard?" "I love to make people happy," he said, flipping his golden cape behind him. "I love to make them smile." Before I knew it he was plugging a movie he made, described as "sort of like the 'Terminator,'" an odd choice for Elvis, but to each their own. "It's called 'Elvis, Trump and What's His Name," he said holding up a business card bearing his likeness alongside a Trump impersonator and a guy who looked like a plumber, but I don't really know for sure. "Okay," I said, playfully acknowledging his ambition. "But what's the ultimate goal, your dream?" He laughed for a moment and said, "I want to win an Oscar." He never told me his real name. A crowd gathered around us, as if my iPhone interview were "The Meg" premiere and I started getting self conscious. People were asking me questions, "What's this for?" "Can I be on camera?" "When will this be up?" Elvis Two, whose "real" name is Danny Zale, sells star maps on the side, and has them exclusively on Amazon. "If you look down, see the stars? I made a map, it's called the Zale Map. It has every single star. Cedric the Entertainer just bought one." "But what is outside Elvis?" I asked, as the two explained their lives outside The King in his signature voice. "I'm the real Elvis," said Elvis Two. "We argue about it every night. No, I'm the real Elvis," Elvis One replied. All I knew was that neither of them showed me who they really were. I stuttered, unable to answer, unable to determine whether this story was worth writing, whether the footage would turn out, whether I was here for the search for the American Dream or just to gawk at lives I didn't understand. I thanked the Elvi, tipped them $5 (they take cards by the way), and finally walked into The Roosevelt and immediately started typing. And in the low light of that iconic place, I realized -- the American Dream is undefinable. It's personal. It's individual. It's your deepest thought and your shallowest desire. For the Elvi it's getting their projects off the ground and making people smile. For the tourists at "The Meg" premiere, whether they knew it or not, their dream was to not miss out on something potentially amazing. For me? I guess it's to understand, or at least try to feel what others do and put that into words. Relate. Help. Share knowledge. If you find yourself on a place like Hollywood Boulevard, the American Dream is there, dressed in light and glitter, walking on two legs, stumbling ever-so-slowly between reality and fantasy. If you look hard enough, you'll find your own version and follow it wherever it goes.